Founded in 1996 in Sullivan County, NY, as Exec Air, Inc. Moved to Naples Florida in 1997 and changed the name to Exec Air, Inc. of Naples. In 1999, added the DBA ExecAir. In 2000, Exec Air, Inc. of Naples expanded its scope of operation to include 10,000 Island Air Tours. In August 2000 Exec Air, Inc of Naples expanded operations again with the purchase of banner tow equipment and began marketing aerial advertising service to: Marco Island, Naples, Fort Myers, Sanibel Island and Cape Coral. John Swasey is a native of Louisa, VA. who has settled in Naples, FL after living in various spots up and down the east coast. He is an Instrument Rated Commercial Pilot, an Advanced Ground Instructor and an Airframe & Power plant Mechanic with Inspection Authorization. John has been a pilot since 1985, logging over 7000 hours of actual flight time in such operations as: aerial fire recon services for the states of Virginia and North Carolina, power line and pipeline patrol in Virginia, air tours in several states, banner towing, charter/air taxi, aerial photography, and search & rescue/disaster relief with the Civil Air Patrol. In 1996, John opened Exec Air, Inc. as an air taxi / charter operation. In addition, John has been rated as an aircraft mechanic since 1988 and earned the rating of Inspector Authorization in 1991 (this is the highest rating a civilian aircraft mechanic may receive). From 1992 to 1996, John managed a repair facility in NY as Director of Maintenance. 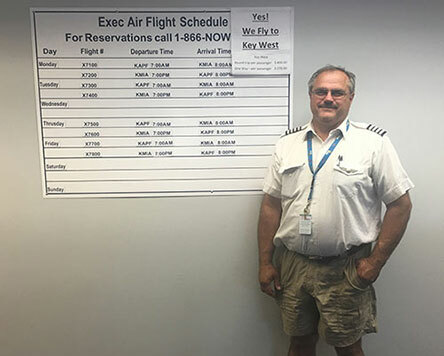 John also has experience in Air Traffic Control having attended the FAA Air Traffic Academy in 1989 and worked at the Richmond Virginia Tracon until September 1990. John has been licensed as an Emergency Medical Technician (EMT) and put in over 19 years of voluntary service in the communities of Louisa County, Virginia (obtaining Life Membership for service), and Liberty, NY. John is now retired after serving 18 years of active service with the Civil Air Patrol Aux USAF. Since 1989 and has obtained the current rank of Captain. He served for two years on Florida Wing Group 5 Staff as Operations Officer, Logistics Officer, and Maintenance Officer. John has served past assignments as a Squadron Level Aerospace Education Officer, Commander of Cadets in a Composite, A Squadron, Acting Commander of two different squadrons for periods of six months to a year at a time, Pilot- Mission-Mountain, Disaster Relief, Search and Recovery/Rescue, and other specialties.